Cold sore is known to everyone annoying pimple on the lips, which after few days period are getting covered by a crust, itchy and sore. This disease is officially called by doctors as labial herpes or sometimes fever. “Cold sore” is another way to call it which is also often used for this disease among the people. Unpleasant situation is happening because of the herpes simplex virus disease of the first type. Almost all the people living on our planet are carriers of this virus. However only about 18-20% of them suffer from relapses when a rash appears on the lips and mucous membranes. Nothing darkens mood as suddenly as appearance of sore cold on the lips. 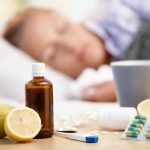 We believe that it is the result of hypothermia, stress or acute respiratory infections. Let’s investigate how to protect ourselves from this trouble and how to heal cold sore at home? Tea tree oil is fortunately absolutely harmless for both our skin and our body. In comparison to all possible affordable medicine in the pharmacy tea tree oil will not bring any side effects but on the contrary it will heal our skin and help to get rid of virus symptoms quicker. Some people prefer tea tree oil instead of any other treatments also because of the beneficial effect for the skin. 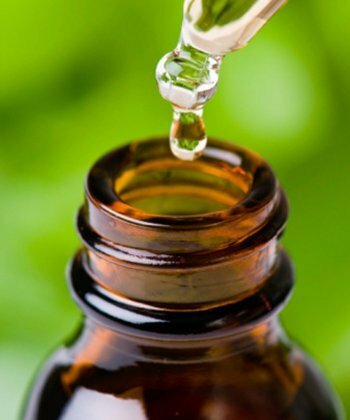 Tea tree oil is known as a treatment from fungi and acne. Wounds and cuts or other damaged tissues should be slightly covered with a drop of tea tree oil and it will recover much faster. Tea tree oil can stop progression of the virus of cold sore in its very beginning. If lips are already showing the visible rash it will dry pimples and help healing. 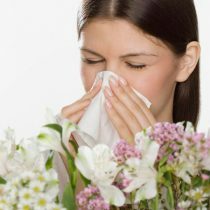 In case you do not have any allergy repeat the procedure as often as you can. If the use of tea tree oil will bring burning feeling it is better to mix it with some water. Such method is non-toxic, totally safe and therefore can be used in the treatment of cold sore even for children. You will notice that tea tree oil is often one of the ingredients of the cold sore medicines and lotions. Warning: As we know every one of us have its own incredible skin color and skin sensitivity. In order to avoid allergy and burns we should first be sure we do not have extreme skin reaction to the essential oil. Fir oil is used a lot in traditional medicine. Mostly fir oil is highly recommended by doctors to fight various types of infections. The best way to get original fir oil is to buy it in special store where they sell all types of essential oils. It can be used also as an ingredient for the preparation of oil mixtures. Due to fir oil warming effect it helps with flu and colds. You can apply fir oil for disinfecting or healing. For the first time this remedy was used long time ago by Greek doctors. 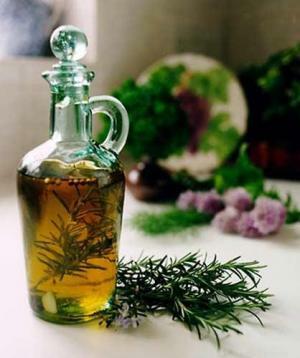 Fir oil strengthens the immune system. Oil relieves irritation of respiratory tract. It influences the nervous system, calms after stress. It is widely used in home remedies as a treatment of cold sore. In order to get rid of cold sore with this oil we will need only a couple of days. The infected spot should be treated with a cotton swab dipped in a solution of pine oil. This may cause burning feeling in the lips. Do not worry about lips color as the fir oil is colorless. Implement the oil extremely gently and try not to contact mucous areas. Warning: Treatment of this kind is not possible for pregnant women and people with ulcers or kidney disease. Honey is often associated with the cold and is highly recommended to be consumed regularly in order to prevent any cold sore or colds. 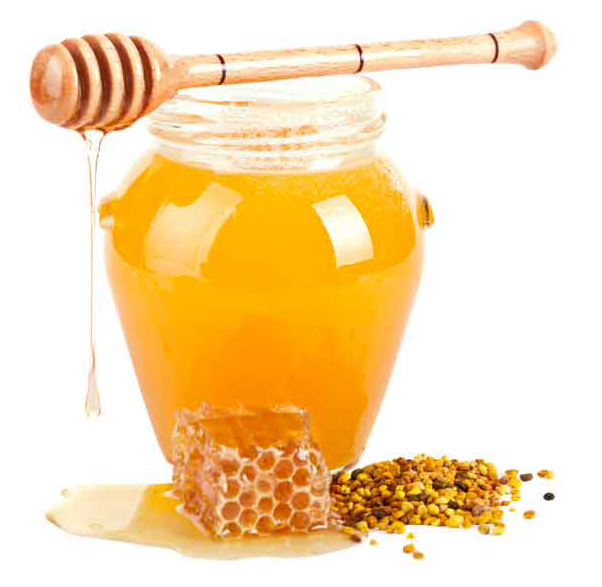 Honey is substance which is known as a sweet and tasty treat. Because of its calming effect usually it is recommended to eat honey before going to bed with tea. In such a way sleep will be calm and long. It is added to herbal decoctions for washing wounds as it is increasing their healing properties. Honey is also used for preparation of homemade compresses and ointments. Honey is rich in glucose. This food provides large amount of various vitamins and inorganic acids. Honey positively effects on the nervous system. Few of us know that honey is in fact a mild laxative. Consume a spoon of honey every single day and you will for sure prevent cold sore. If you cannot eat it on its own you can always add honey to warm milk or green/black tea. Honey makes our immune system stronger. When we already experience bubbles on the lips honey is used as a homemade remedy. Cover lips few times with the honey. This home remedy is not only an effective treatment for cold sore but additionally it is like a spa procedure for the skin. Lips after several honey masks will be very soft. 2-3 days of such treatment with honey will form the crust on the place where you had an infection. If it is not hurting and possible to remove crust with no pain you can go ahead and try to do it. Warning: In order to avoid damage of healthy skin it is better to wait until the crust will fall off on its own and herpes will disappear. Be very careful in order to avoid scars on your lips. Ginger is not only consumed as a healthy ingredient in our diet but also often added during the production of medicines and beauty products. It tastes bitter and that’s why many of us add it in some meals or even in tea to add flavor. Ginger has quite specific but very pleasant aroma. These elements are only part of the list of mineral substances and trace elements with which ginger is rich. Ginger brings positive effect on our digestive system. It is recommended to consume ginger root in case of appetite loss. For the prevention of flu and infections ginger is highly recommended. However it is known as a root you should buy immediately if you got a cold sore. 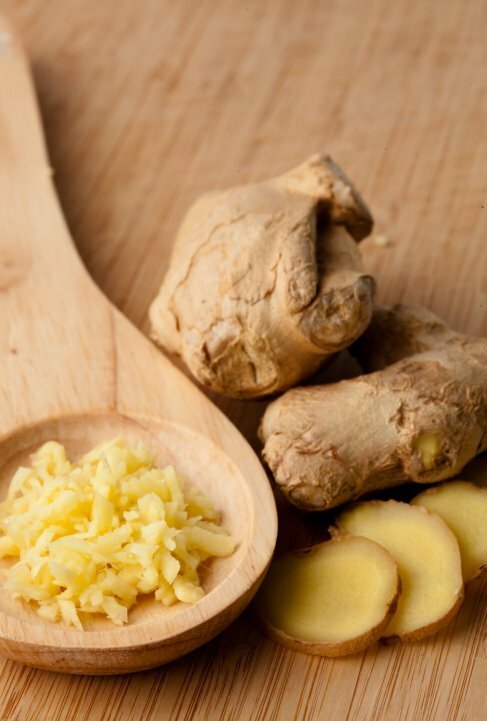 Ginger can and should be consumed every day. Buy fresh ginger root at the market. Prepare a cup of good quality black tea. It is always better to consume natural tea and skip tea bags. Add slices of ginger into the tea cup. Enjoy your tea which now has healing properties and original taste. There is one more way how we can get rid of cold sore with the help of ginger root. We can finely chop the ginger and squeeze it in the hands until it will give us a juice. Put the ginger slices full of juice on the lips. This simple procedure will be not that easy because of the burning feeling on your lips. You should keep compress with ginger slices for 10-15 minutes. Take a break for few hours and repeat the procedure again. Although this treatment brings discomfort it allows you to quickly cope with the infection. The best possible scenario is to implement the method in the very beginning when bubbles will only start to appear. Warning: In order not to lose healing qualities of the ginger do not slice the whole root at once but every time you want to make a tea or a compress slice few pieces and use them immediately. Lemon is one of the most often used citrus in the preparation of homemade remedies. This incredible acidic citrus is a source of vitamins, mineral acids and beneficial elements for our skin and health. Because of the sour taste not everyone can eat sliced lemon on its own. 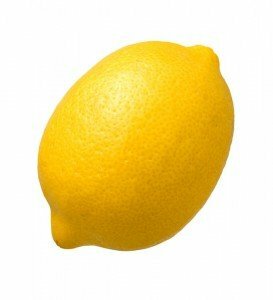 In case you cannot consume lemon alone you can always use it as a perfect complement for drinks, desserts and jams. Useful minerals are contained in pulp and juice as well as in the fruit peel. The beneficial effect is usually noticeable when using fresh pulp. Slices of lemon can be used as compresses several times a day. You can cover lips with fresh lemon juice. Fresh juice is recommended if the swelling is just starting to be noticeable. Basically when herpes is only beginning to develop we should immediately use lemon juice. Wipe your lips with a lemon slice immediately after you notice irritation feeling. In 30 minutes repeat this simple procedure. In the spring consumption of lemon is highly recommended in order to maintain the weakened immunity. It is also an incredible source of vitamins which our body and skin is lacking after the winter. Good quality tea with lemon and honey is an excellent remedy for colds and flu as well as prevention of them. Warning: When no fresh lemon is available at home we can always use essential oil instead. Some of us only know cloves as a flavorful seasoning and never use beneficial properties of this herb for our health. This incredible spice has plenty of useful properties we hardly know about. 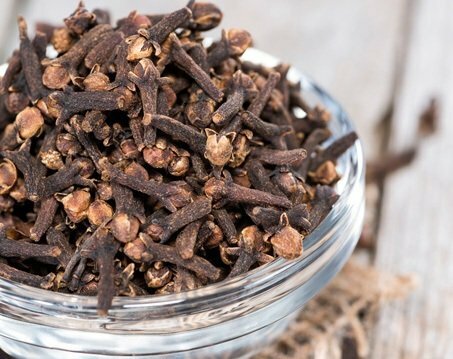 Cloves are used as an analgesic and even because of its anti-microbial effect. Diarrhea can be healed with the help of clove as well as digestion can be improved. Often clove is an ingredient used in the tea for different medical purposes. This herb even helps with such a horrible issue as bad breath. In case you experience toothache you can also solve the problem with this herb. This herb is recommended to be added in case of problems with eyesight and arthritis. Clove oil accelerates wound healing and is used in cosmetics production. Along with all these benefits this aromatic spice can also prevent a cold sore. Chewing few pieces of this miraculous herb will solve the problem completely. Taste of the cloves is not the best ever but it is possible to chew it for some time. As soon as you start implementing this remedy it will permanently prevent herpes development. Useful can be also consumption of beverages with the addition of this spice. Warning: However, this method is not recommended for ulcers, gastritis and hypertension as well as pregnant women and kids. I was able to get rid of my herpes virus last year,i was diagnosed of herpes virus since late 2015 and i was on my doctor prescription ever since, I wasn’t satisfied i needed to get the virus out of my system,i was going through a blog to find new informations about the Herpes Simplex Virus i came across a review of a lady who was cured by Totalcureherbalfoundation gmailcom,I contacted the herbal foundation and they guided me on how to purchase the herbal formula.the herbal products las me for 14 weeks which helps me to get rid of the virus totally.